Lwanda Magere is without doubt the most fabled superhero in Luo mythology. His extraordinary feats could, perhaps, only be rivalled by those of the legendary sorcerer, Gor Mahia. But while the latter was a magician, Lwanda Magere was a war hero to the ancient Luo people, who to date, still revere him. The book, Lwanda Magere, by Churchill Ochieng and Mela Tomaselli, is a simple adaptation that retells this famous folktale from the viewpoint of the main protagonists in the narrative. The tale is about a formidable warrior who torments and hounds his community's adversaries before -- like the biblical Samson -- eventually meeting his death in tragic fashion at the hands of his erstwhile subjects. While the plot of the story is not a significant departure from the same old one that has been retold over the generations, the co-authors speak to the readers through the voices of three women who are central to the development of the main themes of the narrative. The genealogy and birth of a child who would live to become a legend to his kinsmen is told by Lwanda Magere's mother, Nyabera, who in an ironical twist in the tale dies while delivering his much sought after boy child. The next voice in the narrative is that of Lwanda Magere's grandmother, Rapondi, who assumes the mother figure role and later that of a guardian angel to the awe-inspiring warrior when his father, Magere woud Omolo, dies in the battlefield. 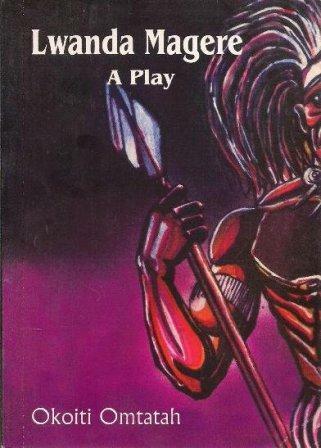 The tale ends in an anticlimax with Lwanda Magere's tragic death, also in the battlefield as a result of an ill-advised decision to marry Aoko, a young, beautiful woman from the Lang'o (Kalenjin) community, who are depicted as the Luos' eternal nemesis in the tale. 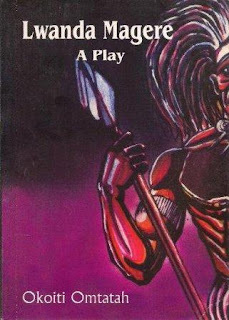 In her own account, the conniving Aoko lures and coerces the unwitting Lwanda Magere to reveal the secret behind his supernatural powers before selling out the superhero to his adversaries. That the co-authors give a summarised history of the Luos in a three-page script at the end of the book is a clear indication that the booklet is a deliberate attempt to give the readers a peek - albeit a flirting one - into the rich culture of the Luo. The co-authors also to some extent demystify the Luo community through the mention of objects, divinities, rituals, beliefs and common Luo words and expressions throughout the narrative with their meanings given at the end of the book. Co-author Tomaselli admits in the introduction to the booklet that the publication is part of her efforts to avail materials which would otherwise remain locked away in the libraries of universities and research institutions. However, a caveat should have been appended in the same line to notify the readers that the book in itself doesn't provide a wholesome history of the Luo which can only be comprehensively understood by reading other literary documentation of the community.